What intrigued me about this novel was that it was not only historical fiction, but that it was fantasy as well. While other novels about Cleopatra do mention magic, it is never an underlying theme, and the heroine is never a source of magic herself. You would think that, with this being the primary difference between Lily of the Nile and other novels about Cleopatra Selene, the use of magic would be more present, but its use is rather sporadic. Since this is the first of a trilogy, I would imagine Dray has Selene develop control over her powers in the succeeding novels, but I was a bit disappointed that she only used them a handful of times without even meaning to. 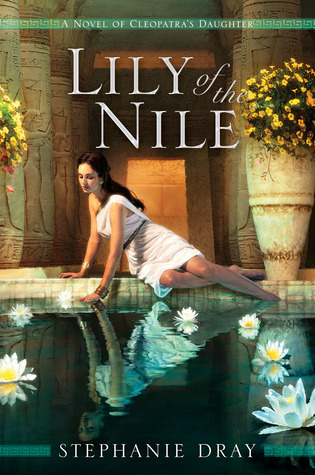 One of my major issues with Lily of the Nile was Dray’s portrayal of the relationship between Selene and Juba. In Cleopatra’s Daughter, Selene is oblivious to Juba’s affections until the end of the book, but in this novel, Selene is not only aware of them, but returns them as well. Dray’s intention for this novel is to empower young women, but what kind of message is she sending by turning such a powerful woman into a simpering, boy crazy teenager? Dray, unlike Moran, chose to keep Selene’s younger brother Ptolemy (called Philadelphus in the novel) alive, even though most sources believe he died before the children made it to Rome. In the context of the novel, it makes sense, but it’s also such a minor part of the greater plot that his presence wouldn’t have been missed had she chosen to follow the general consensus. Tagged Cleopatra Selene, Lily of the Nile, Stephanie Dray.